Desktop parts give it power. High design gives it beauty. Desktop parts give it power; high design gives it beauty. When Dell made the Alienware Area-51m, it broke one mold and created another. Announced at CES Tuesday morning, this gaming laptop is the first to debut a new overall design for Dell’s Alienware gaming line. It also offers no compromises, with desktop-grade hardware and a laundry list of options and upgradable parts. It’s a tantalizing balance of power and refinement. When it ships January 21, several customizable SKUs of the Area-51m will be available. Dell gave us a sample price of $2,549 and said some SKUs would come in under that number. We took a detailed look at the Area-51m at a pre-briefing. Check out the video above for the deep dive. Below, we’ll highlight some of the innovations and specs. 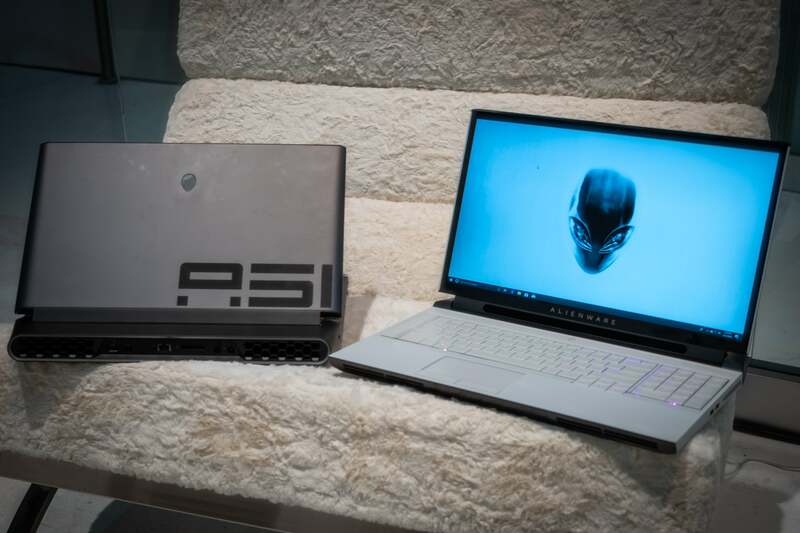 The Alienware Area-51m will come in two colors: Dark Side of the Moon and Lunar White. We’ll talk about the design first, because you’ll start to see it on future Alienware products as the year progresses. Dell wanted to get away from the bristly, black aesthetic that one might call “classic gamer.” The new look, called Legend, features softer, sculpted forms and lighter colors: Lunar White, and a charcoal that Alienware calls Dark Side of the Moon. Most notably, the rear exhaust ports of the Area-51m sport a backlit oval that Dell has variously called a “stadium loop” or an “infinite loop.” It follows whatever lighting pattern you’ve chosen for the keyboard and is ready to taunt your opponents at a LAN party. The upgradability of the Area-51m is impressive and includes the discrete GPU as well as the memory and storage. Most notably, the bottom panel of the laptop includes markers to guide users toward the right tool for the job. The Area-51m also features dual AC adapters: A 180W brick that can be taken on the road (it will power most activities except the highest-end games), and a 250W or 330W anvil for no-holds-barred power consumption. The battery is large at 90Wh, but expect it to be just as helpless as any other gaming laptop’s battery once you fire up a game. 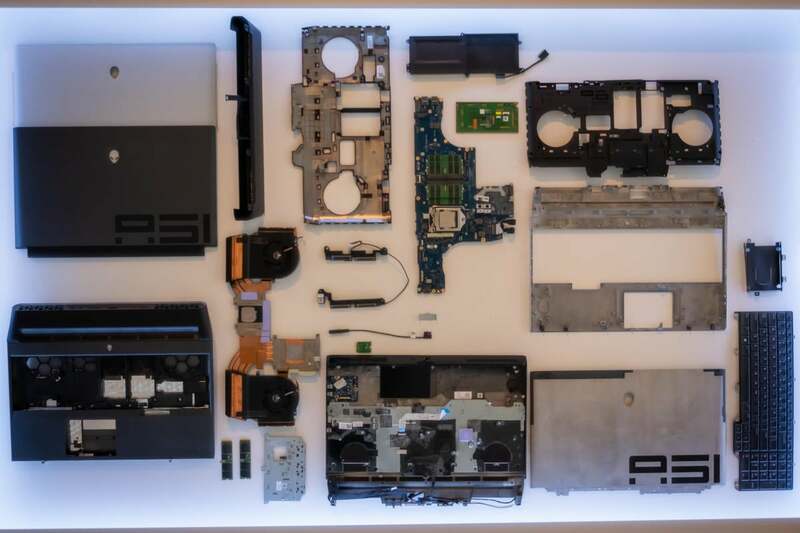 Dell’s blown-out display of the Area-51m shows the two shell colors, the motherboard, the heat pipes, and the drive bays, among other goodies. CPU: Your choice of three desktop chips: 9th gen Intel Core i7-8700 or 8700K, or Core i9-9900K. RAM: DDR4-2400MHz, which you can populate with 16GB to 64GB of RAM, using up to four SODIMM slots. Storage: Your choice of single-, double-, and triple-drive configurations. The drive choices range from HDD/SSD hybrids to dual drives running in RAID with a third supplemental drive. Display: Your choice of four 17.3-inch FHD (1920x1080) displays, with or without touch, with or without gewgaws like Tobii eye-tracking. 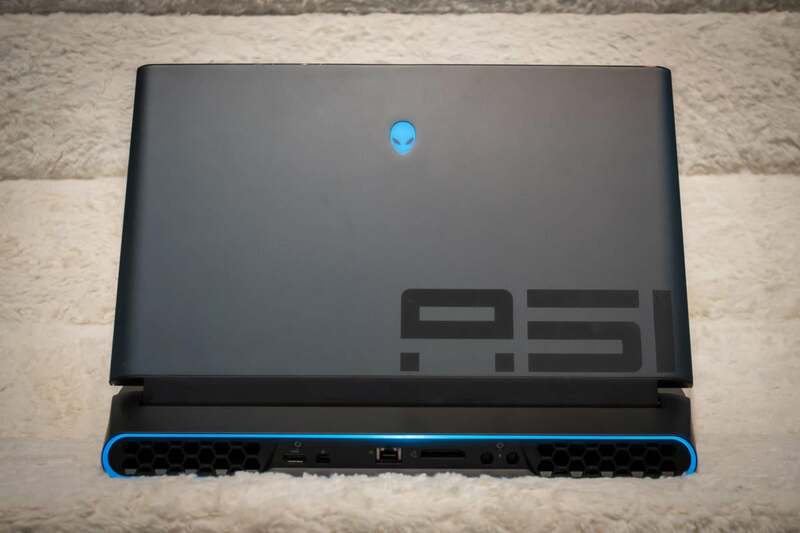 Alienware’s Area-51m leads a fresh charge of gaming hardware from Dell’s premium gaming division, offering desktop-grade parts in a thoroughly thought-out and attractive design. We hope to tell you even more about it if we get chance to review it. This story, "The Alienware Area-51m is a desktop-class laptop both extreme and refined" was originally published by PCWorld.